The Art Program at Portland International Airport provides a portal into the dynamic cultural life of our region. 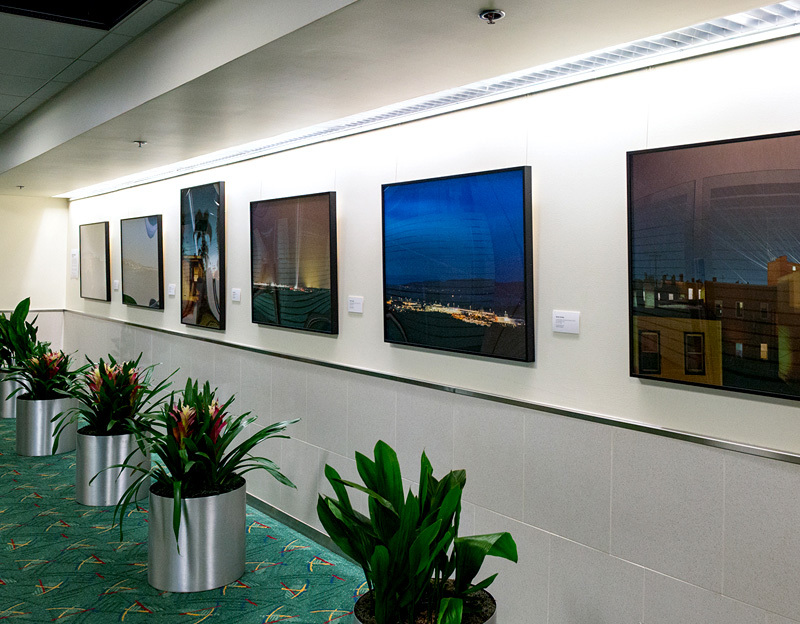 The Port of Portland, which owns and operates PDX, maintains a rotating exhibits program throughout the airport terminal. The program offers nine changing exhibits featuring the work of our region’s finest artists. The Port headquarters also boasts a robust permanent art collection. 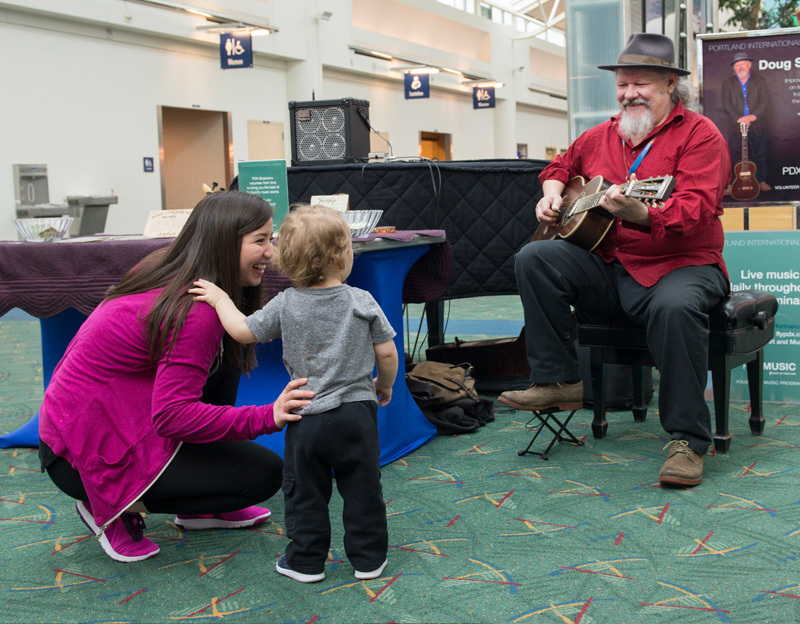 PDX’s music program works to create a relaxing, pleasing and stress-free environment for travelers through the use of live music. Every day, volunteer musicians perform in the terminal and help enhance the passenger experience through personal interactions with travelers. These local musicians volunteer their time, offering travelers an eclectic mix of live music representing some of the best in local jazz, classical and contemporary styles and approaches. 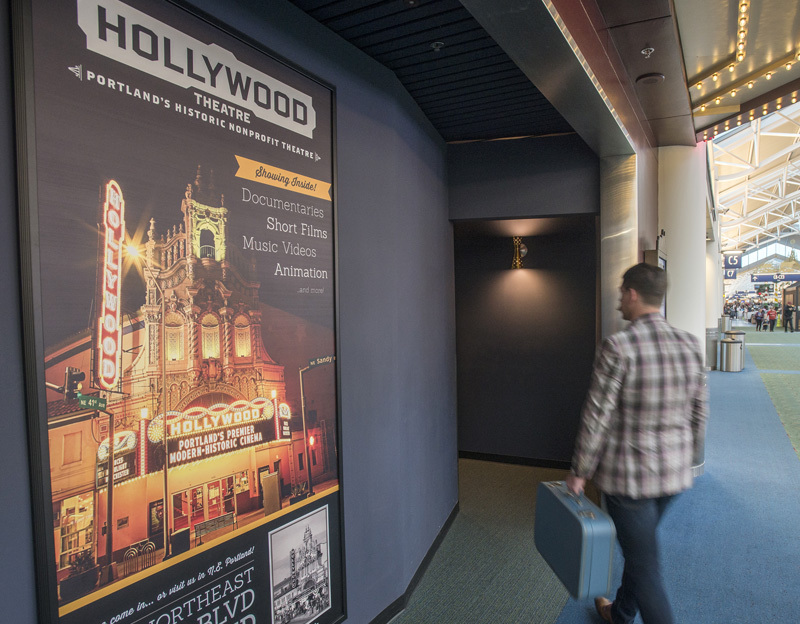 Located on Concourse C the Hollywood Theatre entertains travelers with short films telling stories specific to the Pacific Northwest. It also provides artist residency opportunities, inviting collaboration between national/ international media artists and local filmmakers, and hosts special events. Hollywood Theatre at PDX is free to travelers, who can drop to watch films while waiting for their flights. All films are family-friendly; the short films play consecutively on approximately a 1-hour loop. For a current listing of films currently screening, visit the Hollywood Theatre at PDX section of the PDXArt Blog. Musicians wishing to volunteer to perform at PDX, or those with questions about the music program, please email Jill McPherson or call 503.415.6153. For more information about the PDX Art Program and our current exhibitions, please email Wendy Given or call 503.415.6657.